The massive dog in this photo is not named Hercules. 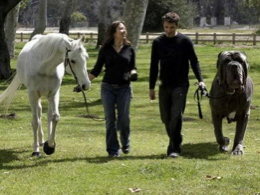 It hasn't been deemed World's Biggest Dog by Guinness World Records. Nor is it an English Mastiff. However, all this incorrect info often circulates with the image. The identity and owner of the dog remains unknown. Its size here is presumed to be a result of image manipulation. However, other images show the same dog massively large. So there's a chance the dog's size is genuine. Kate Winslet complained that photo editors made her look too skinny on this GQ cover. 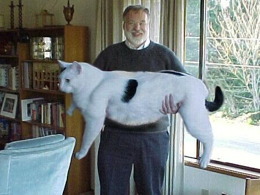 Cordell Hauglie never anticipated that this picture of him holding a digitally enlarged version of his family cat would become one of the most popular images on the internet. 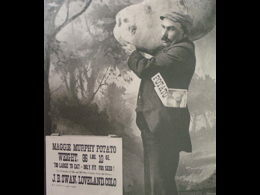 Colorado farmer Joseph Swan created this amusing photo (with help from a local photographer) as a tongue-in-cheek ad to show off his potato-growing skills. But copies of the photo began to circulate, and soon it was being reprinted in magazines as a supposedly real photo, causing Swan to receive hundreds of letters from people seeking seeds from his "mammoth potato" so they could grow their own. This is a very early example of a "viral" fake photo.